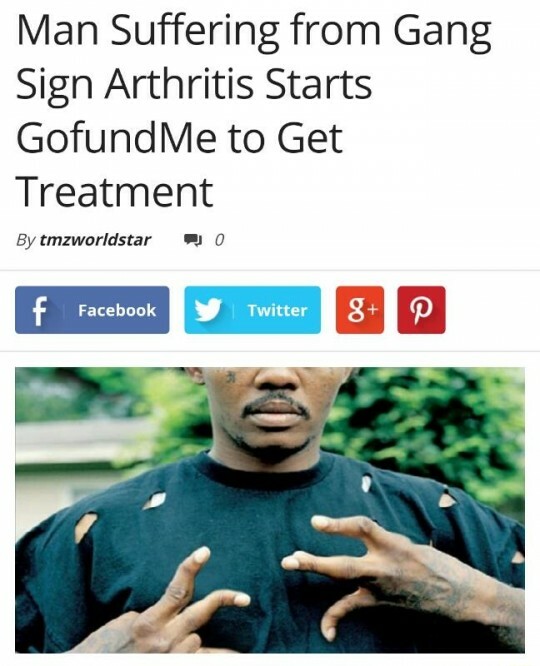 OrbsCorbs: "Man Suffering from Gang Sign Arthritis Starts GofundMe to Get Treatment"
"Man Suffering from Gang Sign Arthritis Starts GofundMe to Get Treatment"
Said JoJo Rhimes lifelong gang member who says he now suffers from gang sign arthritis. JoJo has been a part of the blood gangs of Los Angeles for over 35 years and says all the trigger squeezing and throwing up his set has took a toll on his body. JoJo says he’s only seeking $2300 to cover cost left over after his insurance provider dropped him because he came to a doctors office strapped to which Jojo replied “you just never know”. Ha-ha, now he's a real crip.